Oriental, NC was one of my milestones: one of the places I had marked on my mental map of the east coast as being a place of significance. Oriental is a tiny town with a lot of boats. More boats than people, they say, and I believe it. I'd been there once before, with Helena, by land. We wanted to check out "The Sailing Capital of North Carolina". It's not exactly Newport or Mystic, but it is a friendly little village with lots of boats. I visited the Oriental Marina, mainly so that I could take a shower and catch up on my laundry. I was afraid that any further neglect of these vital activities would cause the Department of Homeland Security to raise it's threat level from orange to red. The Blue Moon also need a bit of a scrub, and it was while I was swabbing the Blue Moon's decks that I started receiving visitors. Two of the visitors were wooden boat fans, wanting to know what kind of boat the Blue Moon was. The third was a reporter named Bernie Harbarts, from towndock.net, the excellent Oriental news website. Bernie wanted to interview me for the Shipping News column that he writes for the website. He took a ton of pictures, inside and out. In fact, he probably has more pictures of the Blue Moon than I do. And after he had asked me enough questions, we just started chatting about sailing, etc., and I more or less started interviewing him! It turns out that I had heard of him, before. Bernie is, when not at his home base in Oriental, what you'd have to call an adventure writer. That is, he goes off and has adventures, and then writes books about them. 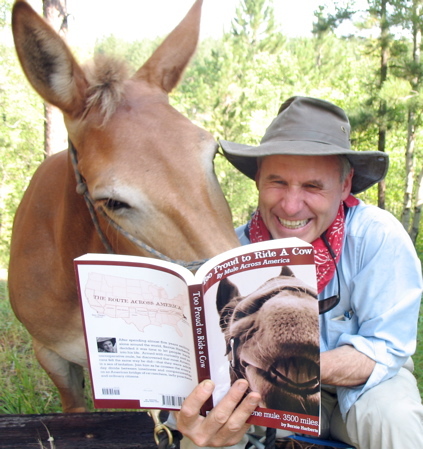 After sailing around the world in a 50' sailboat, he rode the mule Woody across the country, from Oriental to San Diego. The result was the book "Too Proud to Ride a Cow". I'd heard about this book, probably on an NPR program, and since I've been thinking along very similar lines for a thousand miles or so, had a lot of questions for him. I won't bore you the details of our conversation about the book business, but I found it very interesting, and encouraging, to talk to someone who was actually 'doing it'. Anyway, he's a terrifically interesting and funny guy and I'm sure his book is too. I'm going to buy a copy as soon as I get home and recommend you check it out. Check out his website, too: http://riverearth.com. Tell him John from the Blue Moon sent you! After departing Oriental, I entered what I have come to call "The Wilderness". This is the stretch of the ICW between Pamlico Sound, and Albermarle Sound. I have been in some pretty wild places on this voyage, including the Georgia marshes, but this stretch seemed the most wild and isolated of them all. Not even a blink of a cell phone bar for two whole days. That's a record! I'm sure it's not that isolated if you are traveling by land, but by sea it really did feel that way. And when I was swinging at anchor at night, with not a light, or house, or car, or boat in sight, I really felt like I was 'out there', in the wilderness. Nonsense, of course, on the busy east coast of the US, but feelings are reality, and the scenery really was beautiful. The beauty of traveling by slow boat -- no wake! I'm not sure if these pictures capture the beauty of this area, but it really was lovely. Meanwhile, a storm seems to be brewing up north. More on that, next time! I've been following you here for a while now, and have read most of the writings. This is the first time that I've noticed that there is no gunwhale on Cabin Boy. It gives it a very minimalist appearance. Very nice. Hi Paul! You are right that there is no gunwale on Cabin Boy, but if you check out the "Bits and Pieces" post, you'll see that I cut the notches for them in the breast hook and quarter knees. I just didn't have time to cut out a gunwale that would fit (it needs to be spiled to fit properly.) I had to rush to finish Cabin Boy so I could go down and start working on Blue Moon. Luckily, the glued lapstrake planks make Cabin Boy so stiff that gunwales are not really necessary. However, when I get home, I intend to refit Cabin Boy, replacing the thwarts with real wood (they are just plywood at the moment), fitting the gunwales and rub rail, and refinishing everything else.